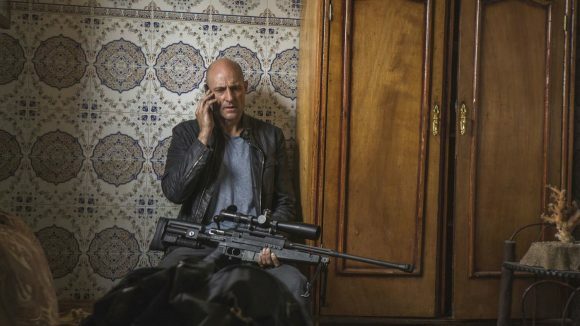 ➢➢ “Mark Strong brings his strong-and-silent charisma to the role of a former spy whose family — two families, actually — becomes collateral damage in a conspiracy that stretches from the C.I.A. to MI6 to the Iranian power grid … Superficially entertaining and predictable … combining elements of the Homeland-style vast-conspiracy story and Liam Neeson’s avenging-father films. The familiar sights and sounds — the arrogance and avarice of Americans, the inevitable presence of sharp objects on desktops during fights to the death — are presented with a businesslike restraint that makes them reasonably credible.” — New York Times. ➢➢ “It is a gripping, quick ride as it rattles along, with big bangs and fabulous locations, but it is very much in the footsteps of Homeland, The Night Manager and the Bourne movies. Even the soundtrack’s ominous descending notes of doom at perilous moments are familiar. And it doesn’t have the writing, performances or depth of character of those former shows.” — The Guardian. ➢➢ “There’s not much to fault in the execution that isn’t nit-picking — the show can go a little heavy on parallel cutting between story lines and a reliance on the sort of cliffhangers and misdirection your ancestors might have enjoyed in a Buck Rogers or Gene Autry serial. We have seen enough of such stories that not every twist will prove a surprise, and as if to remedy this, many twists have been given twists of their own.” — Los Angeles Times. ➢➢ “The action is great fun and the show looks good, but there’s little to grab onto even as one knows the show ought to be getting incrementally more ‘tense.’ Surely even in the high-pressure world of espionage, there’s time to make us care about the spooks for more than just their abilities and their adventures.” — Variety. ➢➢ “You want explosions, beautifully tiled interiors and a soundscape dominated by Muslim calls to prayer? You’ve got ’em. The references to current events and international relations are rote, definitely less nuanced and invested than Epix’s otherwise similar Berlin Station … Too much of Deep State is bogged down in shallow family characterisation, and very few of the assortment of bureaucrats, field agents and generic Middle Easterners register as distinctive either.” — The Hollywood Reporter. There’s nothing new here but the show is a good watch. It will be interesting to see where season 2 goes.